Pocket CorkScrew and Wall Hanging Wine Bottle Cork Openers : As most of our visitors and customers are wine enthusiasts, as of recently we have added the below, European Made, hard to find cork wine bottle openers to our product portfolio. Currently we offering the Pocket Cork Screw, the Vintage looking Wall Mounted Wine Bottle Opener and a more classic looking, bronze like finished one. These corkscrews are not mass produced and should you be interested in any of these items contact us. BELOW: A handy, yet elegant Pocket Wine Bottle Brass Made CorkScrew that is no larger than a small pen. Once this 'cork drawer' cap is removed it can be inserted into the screwer's top part to act as a sturdy Pull handle. An great gift idea for an avid wine enthusiast or cork screw collector! LEFT AND BELOW: The WBF305 Artistic, Brass casted Wine Bottle Opener is an artistic copy of an antique cellar Wall mounted CorkScrew . The corkscrew is hand twisted into the cork cap and while the lever is lifted the bottle is held at the bottom. Once the corkscrew is hooked up, the lever is down stocked and thus effortlessly uncorks the bottle. A great feature to add to a wine cellar, wine bar or restaurant! 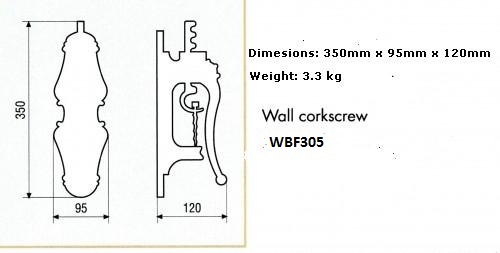 ABOVE & BELOW: The WBF107 Classic, Brass casted Wall mounted Cork Screw comes in a 'Bronze like' finish and is ideal for modern kitchens and cellars. The corkscrew is hand twisted into the cork cap and while the lever is lifted the bottle is held at the bottom. Once the corkscrew is hooked up, the lever is down stocked and thus effortlessly uncorks the bottle. A great feature to add to a wine cellar, wine bar, restaurant or kitchens! Sample, Trade and Non Trade Orders: Our Brass made Pocket Corkscrews are usually in stock whilst the Wall Mounted Wine Bottle Cork Openers are typically available by custom order and can be purchased Internationally in any quantity and do not carry any minimum order requirement.